I set up several scenes, and one scene to composite the others into a single render. If I try to render from the Compositor scene, blender crashes. If I render each scene separately, no crashes. Load the attached .blend file. Switch to the Scene called "Compositor". Are you using the latest Blender 2.8 build of today's 2019-02-06? @Marco (nacioss): you have to specify some existing output folder, if I do that I can render the whole sequence. As already asked, are you using an up to date blender beta? Yes, I was using the downloadable beta of Feb 06, 2018. In which scene? All of them? Every scene in the .blend I submitted does, indeed, have an output folder specified. The folder exists. That's what I'm seeing when I reopen the file I sent you. Here's an actual work file that exhibits the bug behavior. This crashes even after I've ensured that each Scene has an output path, specified to a folder that already exists. This is the actual work I was doing when I discovered the bug. I confirmed it moments ago, using the latest available blender beta as of 15:06 Eastern time today, Feb 07. So you are can not reproduce the issue on the initial blend file in the bug report? Or can you still reproduce it on the minimal example you provided at first? I cannot reproduce it on the first .blend I sent, using the latest beta I have (from the latest available blender beta as of 15:06 Eastern time yesterday, Feb 07.). When I sent it to you, it crashed for me twice, but isn't doing it now. I just tested it again moments before clicking to send this message. The 2nd file, however, exhibits the bug reliably. I just tested it again, too, moments before clicking to send this message. 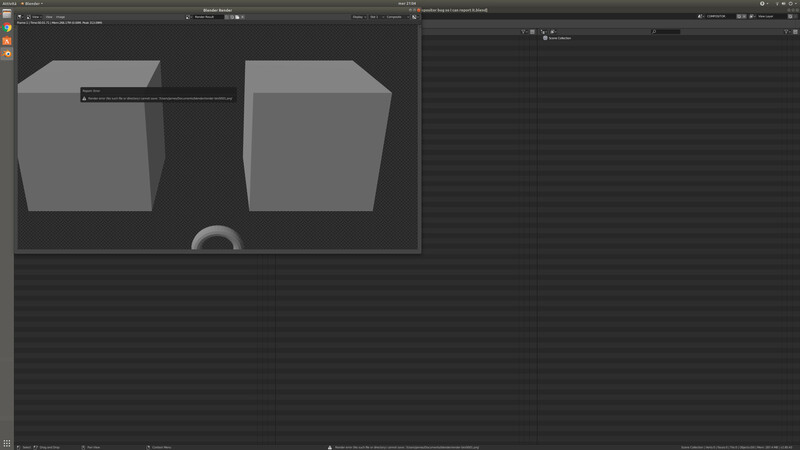 Blender crashes before rendering a complete, composited frame. Sometimes, it would render a frame or two, but mostly, it crashes before writing the first frame to a file, it seems to me. with today's download of blender 2.80 beta, on Friday, February 8, 2019. If there's something else that I can provide to you, or test for you, I'll be glad to do it. Sebastian Parborg (zeddb) added subscribers: Sergey Sharybin (sergey), Sergej Reich (sergof). I don't think this has to do with compositing. I can reproduce the crash in the compositing scene. and then render 2nd crime TOON LINES. As you can see, the crash happens in the rigid body physics system. Thread 27 "blender" received signal SIGSEGV, Segmentation fault. @Sergey Sharybin (sergey) feel free to reassign to @Sergej Reich (sergof) if this is not for you.